Phragmites is an aggressive non-native species that is difficult to fully control unless treated aggressively and annually. 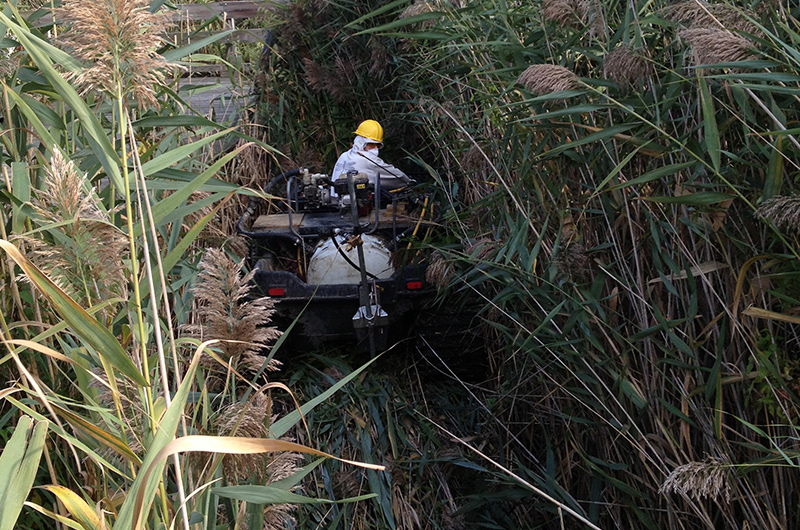 Niswander Environmental is uniquely qualified to control invasive Phragmites as our firm is comprised of Ecologists, Arborists, T&E Permit Holders, Professional Wetland Scientists, and Certified Pesticide Applicators well-versed in plant and natural community identification. Niswander Environmental has successfully treated over 6,000 acres of invasive vegetation (including almost 4,000 acres of non-native Phragmites) over the past eight years for a variety of clients, including the Michigan Department of Natural Resources, the United States Fish and Wildlife Service, the Michigan Department of Transportation, Huron-Clinton Metroparks, Wayne County Parks, Ottawa County Parks, various Homeowner’s Associations, and numerous local municipalities. Niswander Environmental was contracted by The Nature Conservancy in August of 2014 to provide mapping and control of approximately 600 acres of invasive Phragmites within designated areas along Lake Erie in Monroe and Wayne Counties. Niswander Environmental utilized a variety of application methods depending on the access and the density of the Phragmites population. In areas that contained isolated stems or that were located near high quality native vegetation, Niswander Environmental selectively spot treated or hand wicked individual stems of Phragmites so as to avoid collateral damage to desirable species. Niswander Environmental targeted larger stands using 3 gallon Solo Backpack Sprayers and vast monocultures of Phragmites were aggressively treated with ATVs and Argos. Niswander Environmental provided the client with detailed maps and GIS files of all treated areas upon completion of the project. If you have any questions about our invasive species control services, please contact the office at 810-225-0539 or info@niswander-env.com.